The Museums Across the Curriculum course has been led by Patty Nichols for the last 10 years. One of three that she has developed, this course explores Lexington and Concord, Massachusetts — and while I live a town or two away from both of these places, I generally go to them for shopping. What a shame to have two such historically important places within 10 miles of my house and to have never explored their history. And thus, I have become a tourist in my own backyard. 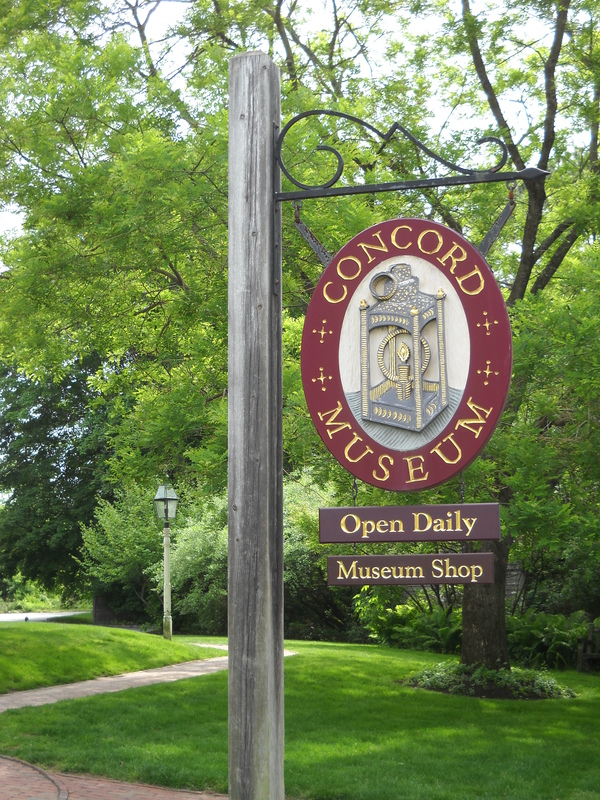 Today’s visit was the Concord Museum. While the building itself is not old, it contains a collection of artifacts representing the history of Concord from it’s Native American roots through the time of the transcendentalists. One of the more interesting explorations for me was the Period Rooms, and the one I enjoyed most was the 19th century chamber. The elegance of the furniture’s detailing, the tea sets and desk ecoutrements lead one to believe that this person was a person of substance, someone for whom life is more than just survival. I wonder how similar this chamber looked to that of my maternal great-great-great grandparents, New Englanders who settled in Covington, Kentucky in the 1840s. Many of the artifacts in the Special Collections come from the everyday lives of ordinary Concord citizens — a needlework picture of a family’s mourning, a child’s coat from Bon Marche in Paris, a signed friendship quilt given to a new bride. We look at these items as quaint curiousities. But what of the material evidence of our lives will be examined long after we are gone? What of our material possessions will represent our culture and way of life in the 21st century? 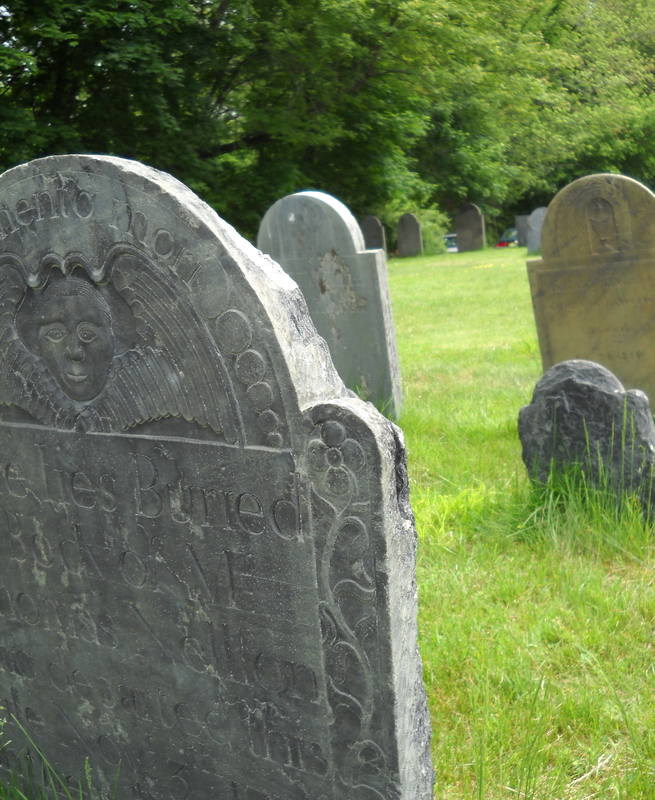 After leaving the Museum, we stopped traveled to Sleepy Hollow Cemetery near Concord Center. 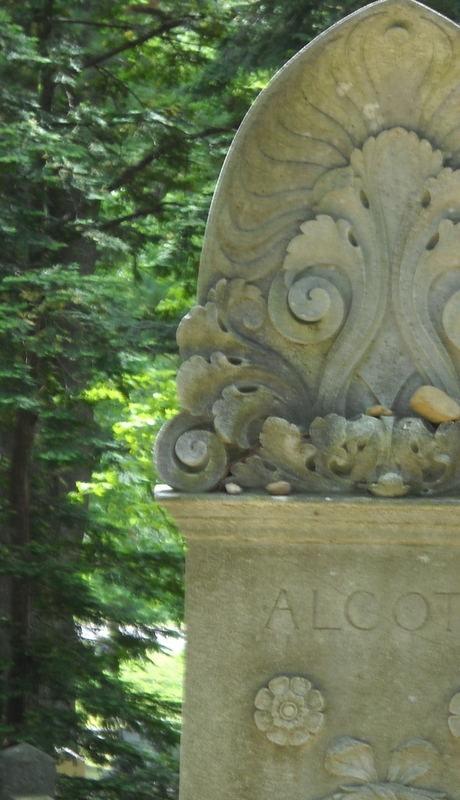 How curious that on many of the gravestones on Author’s Ridge were small stones or pebbles? Is there a significance to the placing of pebbles on an ancient gravestone? Someone had left flowers at Emerson’s grave. Our guide suggested that often mementos are left at Henry David Thoreau’s site as well. I have to confess that prior to visiting the Museum and the Cemetery, I had forgotten quite a bit of why Emerson, Thoreau, Hawthorne and the Alcotts were important. Oh I remember they were intellectuals. But what really makes them important to learn about and know about? What is their place in history? How is it that even in death, people seek their burial site in order to pay respects? I am in Lexington Center at least once a month — and again, I’ve never stopped to explore the historic aspects of the Center. How does that happen? How do we forget to take advantage of the history around us? Our first visit was to the Lexington Battle Green. 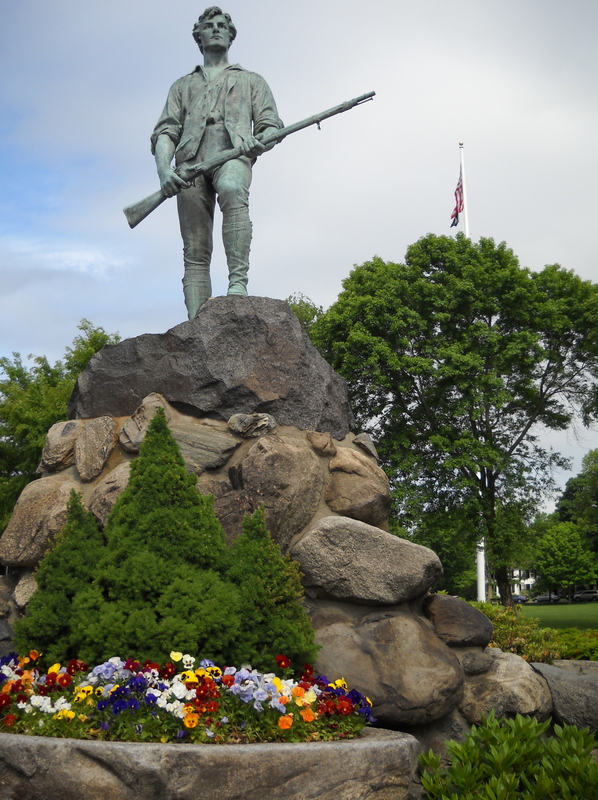 How curious that Lexington is “known” for the Minutemen, yet did not have an Minuteman in the town’s militia? The romanticized version of the Battle of Lexington and Concord ignores the truth that this battle was a massacre. Lexington was a small town; many of the citizens were related by blood or by marriage and when the British Army engaged them, the sad aftermath was horrifying. The strictness of society prevalent at this time – the central importance of organized religion and required citizens to follow a rigid set of rules; there was no separation of church and state. Citizens relied upon each other for essentials needed for survival – is this the beginnings of cooperative learning and living? Finally, we made a brief visit to the Burial Ground near the Battle Green. How sad to see entire families wiped out within a couple of weeks due to illnesses we can now prevent and control? How did mothers and fathers not become morosely devastated by such events? I do not see myself as able to accept such sadness as “God’s Will”. Our explorations today were of the intellectual community in Concord. First we visited Orchard House, possibly the most famous of the Alcott family homes. 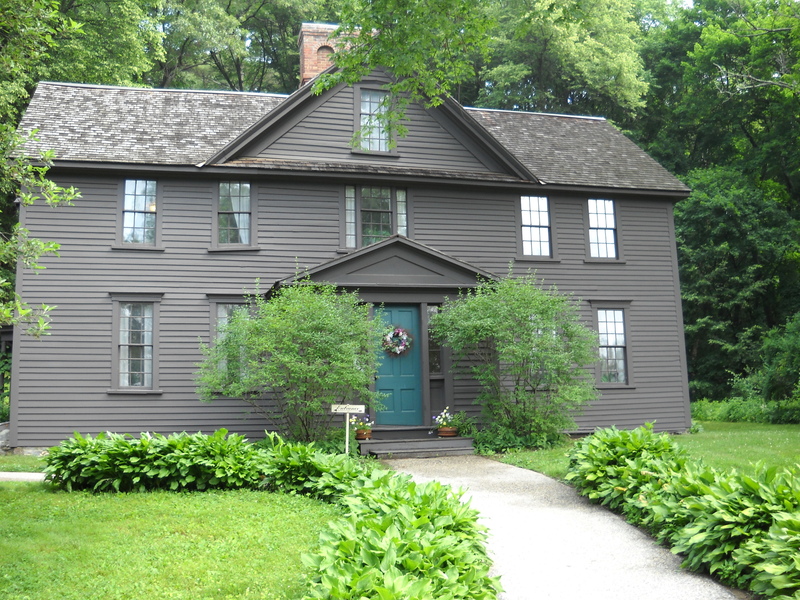 When the Alcott family lived in this house, it was bustling with intellectual engagement. The beautiful watercolors and paintings of May, the formidable library belonging to B ronson, the writings of Louisa May; all are celebrated in this house turned museum. What is phenomenal about this particular museum is that 80 percent of the house and furnishings are from the Alcott family. So where we walk and visit, we are able to see things as the Alcotts had them. 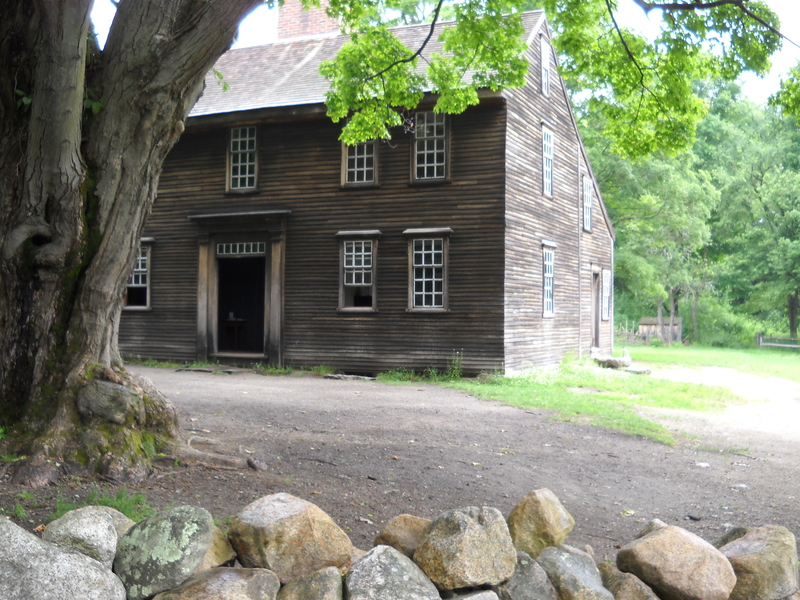 The second house museum on the day’s itinerary was the Old Manse, the home of William Emerson who was a church pastor for Concord during the time of the Revolutionary War and later, a property rented by Nathaniel Hawthorne. Most remarkable was the view of North Bridge from the second floor study of William Emerson. Imagine Emerson’s wife Phoebe looking out this window as the British Regulars lined up to face the colonial militia stationed across the river on the opposite side of the bridge. I would have been frightened beyond imagination at the sight of the British military in all its glory ready to mow down the colonial militia. And then, as the militia proceeded to cross the bridge, the unimaginable — the British Regulars actually trying to retreat from the militia. Also, from the second floor study, the windows etched by Sophia Hawthorne with her diamond. Would my own landlord have been pleased that I defaced property? I doubt it. The Manse at this time was a hub of refinement, of men with the time and means to spend days pondering life. In this modern time when we typically multitask and work, work, work, this manner of living seems at once quaint and unrea chable. 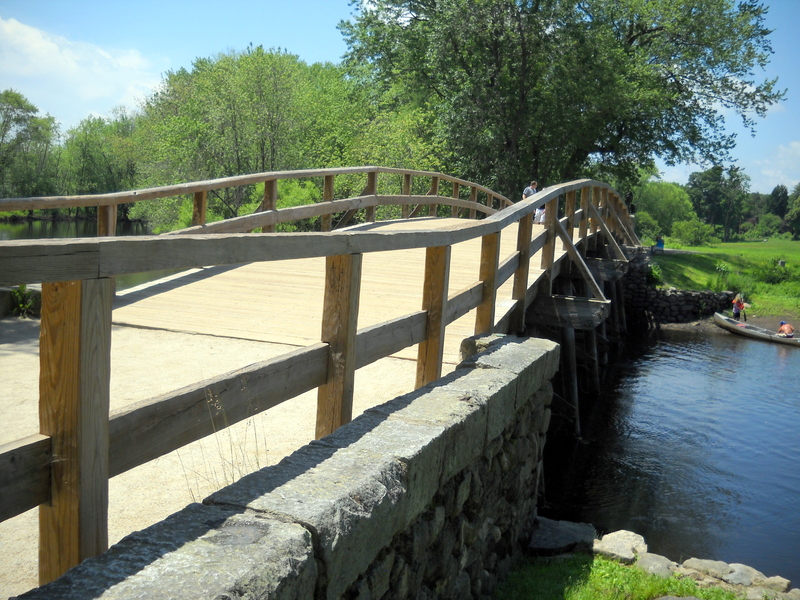 As we were within walking distance, we visited the Old North Bridge – which is a new North Bridge. Many people were on the bridge on this day as the weather was sunny and warm. Canoes glided along the river as did a family of ducks. A gentle warm breeze rustled the grasses growing where colonial farmers no doubt had fields, although in April 1775 it is unlikely that any farmer would have had noticeable crops – too cold still for planting. We walked the meandering pathway to the Visitor Center through these fields. Was that the hill where the militia positioned themselves? It is difficult to connect to the fact that many years ago, in 1775, people walked these same pathways. While I was looking forward to a guided tour of the Battle Road, the weather today – a soaking rain – made it difficult to look forward to a day spent out of doors. This part of the course, however, was where my interest was as I planned to create lessons about the Battle Road in 1775. First of all, the multimedia presentation at the Visitor Center was really quite well done and I can imagine that my students would be very engaged by it. The events of April 17-18, 1775 are told from the prospective of Amos Doolittle, and engraver and sometimes artist from New Haven, Connecticut. In real history, Amos arrived in Lexington with the New Haven militia to assist in the battles around Boston, and he arrived in Lexington just 2 weeks after the events of April 18. Our next stop was the Hartwell Tavern. The ranger at this site was most knowledgeable and gave us an enthusiastic talk about her costume and dressmaking in the 1770s. The tavern, once a busy stopping place for travelers going on the east-west route across Massachusetts and on to Crown Point in New York, was quiet and dark. Stuck outside of any town, the Hartwells would have to be self sufficient in order to survive. What is incredible is that the Park Service has rescued the Tavern and the Battle Road from modernity and transformed it into a living history museum. After visiting these historic spots – all within 15 miles of where I live – there is a realization that we often do not value the treasures we have right here in our own backyard.